2013 is one of the earliest Cherry Blossom seasons in history in Tokyo, and Japan for that matter. On March 16, the cherry blossoms officially started to bloom in Tokyo. It was almost 10 days earlier than normal meaning the hanami season is now almost upon us. Parties are being planned for the next 2 weeks and it would appear that things are continuing to go smoothly. 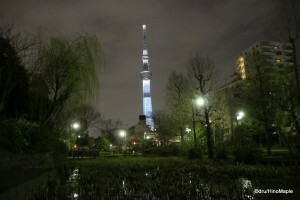 Ueno Park is in full swing preparing for the festivities and Tokyo Sky Tree has also gotten into the swing of things. 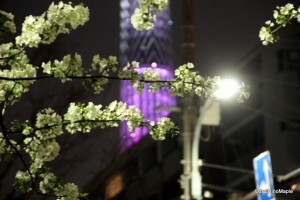 As of March 18th, Tokyo Sky Tree has been changed to its hanami colours. Every 15 minutes, Tokyo Sky Tree will be changing between a white and pink version. The white version is a simple white base with pink sparkles. The pink version just changes the column to pink. It is really nice to see and will be great when the cherry blossoms are in full bloom. If you are in Tokyo at that time, you will be able to get a lot of good photos. 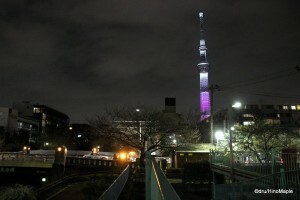 Tokyo Sky Tree will be having this special colour until April 10. Hope you enjoy the couple of photos I was lucky to get before my trip. Sky Tree through some blossoms. This entry was posted in Sakura (Cherry Blossoms), Tokyo and tagged Blossom, cherry, Cherry Blossom, hanami, hanami party, japan, party, pink, Sky Tree, tokyo, Tokyo Sky Tree, Ueno Park by Dru. Bookmark the permalink. Wish I can them firsthand! Glad you enjoyed it. I just got back to Tokyo and it is now raining. Ruined my plan to go to Meguro to see the cherry blossoms. Might have ruined my chance to enjoy it too. Shikoku had no cherry blossoms, or just a couple. Mainly plum blossoms but they were all falling off at that time. 🙁 Hope you can enjoy them again someday.